This post will show the next six weeks of events. For the latest, complete, up-to-the-minute list of events, always check http://www.socalcasa.info/calendar/. And to submit an event you don’t see on that page, please fill out this form or e-mail me the details! 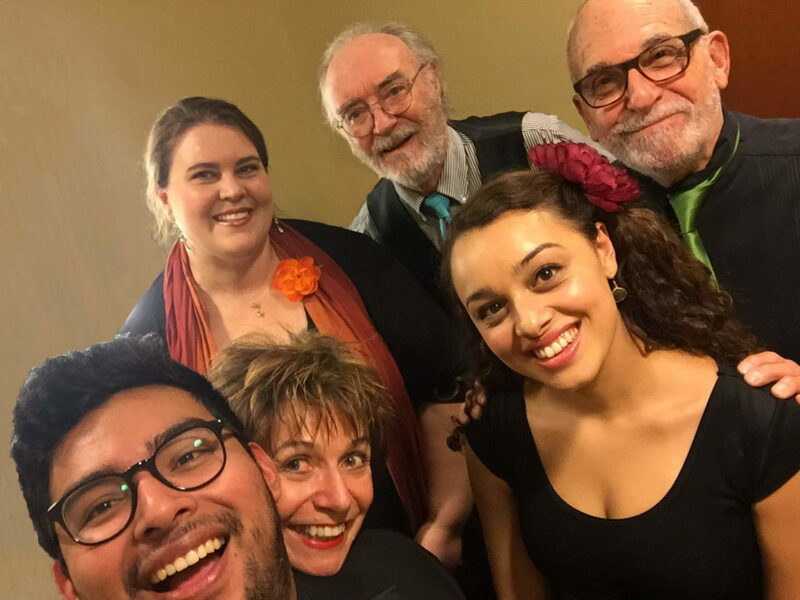 Award-winning Los Angeles vocal ensemble M-PACT returns to Torrance for their El Camino College debut. On the heels of their headlining performance at the Jazz Education Network (JEN) International Conference and whirlwind European tour, the program will include selections from m-pact's new EP "Wonderful World", as well as a diverse program of pop hits, jazz standards, and Motown classics. With their unmatched artistry, dazzling vocal range, and powerful vocal rhythm section, it's no wonder m-pact is respected worldwide as a cutting-edge trailblazer in the realm of a cappella music Come experience the power of the human voice as you've never heard it before! A near recreation of a typical event in a setting that is reminiscent of real USO events of WWII!! And of course: The Coastliner Chorus! Buying a table? Includes a FREE round of drinks or bottle of champagne! Join the Masters of Harmony and our special guests: The Westminster Chorus! You won’t want to miss this musical extravaganza with two legendary choruses together on stage for their annual Spring Show. You’ll also enjoy 2018 BHS International quartet finalist and audience favorite, The Newfangled Four. Come experience unforgettable performances worthy of the 12 international gold medals shared by these amazing choruses. For tickets, call the Carpenter Box Office 562-985-7000 or visit www.carpenterarts.org . Ticketing service charges may apply. A $5 per ticket discount is available for groups of 20 or more by calling the box office. Join this top 12-voice mixed ensemble for a concert featuring the Oscar-nominated music of Freddie Mercury and Queen. Also favorites from The Beatles, Dion and the Belmonts, Eric Clapton, Bobby Darin & more. For more information, call Harris Levey (310) 822-9067 or visit westsidevoices.com . It is an absolute honor to kick off the 2019 Tiny Porch Concert Season with the Leftover Cuties! We have been long time fans of this concert series, and our hearts are full as we tread on sacred ground following the devastating fires of 2018. Please join us for an incredible evening of music, cheese, dancing, and nature! Leftover Cuties first big break came early on, when their tune “Game Called Life” was chosen as the opening theme for Showtime's hit series, The Big C. Combining alluring female vocals, ukulele, upright bass, horns, keys, accordion, and not so brushed drums; this quartet called Leftover Cuties have a unique sound to call their own. Coupled with classic songwriting, relatable lyricism and effortless interplay, the Cuties live performances are magical, charming experiences that will surely have you falling in love. Bring your family and friends to First United Methodist Church - Ventura on Wednesday, May 22nd to enjoy an evening of a cappella music with Pacific Sound and Channelaire! We’ll be showcasing music from a wide variety of genres and showing you the type of fun we have every week at our rehearsals. Thank you for all your continued support for our organization, and we hope to see each and every one of you at our show! Tickets available via bit.ly/ANightofHarmony , directly from members, or at the door. I’m Jessica, a long time musical theatre professional, former Groove 66 member and lifelong a cappella lover. I’ve always craved a place where I could connect with other singers, keep my vocal chops gig-ready and sing somewhere that wasn’t by myself in my apartment closet. So I’ve created a choir and music community called Stay Singing. For now, we have a couple youth choir classes, as well as a Teen/Adult Choir and a Pro Vocal Solo Workshop with the intention to create a cappella and small pro ensembles out of these. We also offer a monthly Singer’s Roundtable where we set personal artistic goals, present songs and build professional relationships. Classes are ongoing and we have open enrollment. Most classes are $85/month. Swing Shift, an a cappella vocal jazz sextet, has an opening to replace our loved but soon-to-be-departing 2nd soprano. We’ve been singing locally for 10+ years. If you love mastering tight harmonies and jazz rhythms, please contact us. Our website is www.swingshiftvoices.com. Premiere is excited to announce that we’re holding auditions for new members! We’re looking for ladies who have significant high school, collegiate, or post-collegiate a cappella experience. Expected time commitment is one rehearsal per week (Wednesday evenings, generally in west Los Angeles or mid-city), and one to three gigs per month around Los Angeles. We’re looking especially ​for sopranos and altos who can belt, and vocal percussionists, but ALL voice parts will be considered! Email your online audition to premiereacappella@gmail.com by May 7th with Summer 2018 Audition in the subject line. We’ll be holding in-person callbacks on Wednesday, 6/30, and we’ll be sure to respond to everyone who submits an online audition. We’re a group of young working women, proud that Premiere brings us together for a musical outlet outside of our day jobs. Songs we like to sing usually have a powerful belting solo, a lot of attitude, and/or a message of female empowerment. Premiere has been together for four years, and in that time we’ve done a lot of exciting things, like performing for TBS and an LA Galaxy game, hosting the Los Angeles A Cappella Festival, and becoming great friends. If this sounds like the place for you, we’d love to hear from you! ​Questions? Feel free to contact us! Thanks for your interest, and we look forward to singing with you! Frequency A cappella is looking for a new soprano! We meet weekly in the Yorba Linda area. Ideal candidate is comfortable singing lead or harmonies and is looking for a new musical family. Please email tom.keyes@vocalfreqs.com with any questions or interest. VALLEY HARMONY SINGERS is looking for men in the San Fernando Valley area who like to sing! Our chapter of the Barbershop Harmony Society was founded in 1956 & has appeared on the International Contest stage, as well as on the Jerry Lewis MS Telethon & the PBS Holiday Show at the Dorothy Chandler Pavilion. We frequently sing in the community, most recently at the Studio City Picnic & the Encino Community Fair, as well as for private parties & special events. We have a Fall & a Spring Show, an Annual Ice Cream Social, and Singing Valentines. We meet on Monday evenings from 7:00-9:30 P.M. in the Social Hall at St. Mark’s Episcopal Church, 14646 Sherman Way, Van Nuys. Check out our website–www.ValleyHarmonySingers.com & Valley Harmony Singers on Facebook. Call us at 818-994-SING, e-mail–ValleyHarmonySingersChorus@gmail.com. No previous barbershop singing experience needed! We’d love to have you join us! Premiere is excited to announce that we’re holding rolling auditions for new members! We’re looking for ladies who have significant high school, collegiate, or post-collegiate a cappella experience. Expected time commitment is one rehearsal per week (Wednesday evenings, generally in west Los Angeles or mid-city), and one to three gigs per month around Los Angeles. We’re looking especially ​for basses, sopranos who can belt, and vocal percussionists, but all voice parts will be considered! Looking for tenors for Ha’Penny, a madrigal and holiday a cappella group. Occasional stipend. Rehearse as needed; perform at fairs, festivals, and other types of events. Lots of great music and tons of fun! E-mail ter@lovingstone.com if interested. Thanks, looking forward to singing with you! Blindside is an a cappella trio, looking to fill out our lineup. Founded by blind individuals, Blindside has a big passion for helping others and would love to include more visually impaired members, but the bottom line is, we’re looking for fun, funny, talented people with a desire to make great music together, so all are welcome! We focus on contemporary rock/pop covers, but we’re not going to shy away from the right classics or comedy tunes, as long as they form part of a cohesive set. Depending on the gig, we’ll pepper our shows with originals as well. Blindside has performed at the Lion’s Club International 100 Year Anniversary in Chicago, charity events in North Carolina, and won Best Arrangement at the 2016 Los Angeles Regional harmony Sweepstakes! A talented high tenor – we’ll know the right fit when we hear it. Strong solo chops need to be balanced against the ability to pull back into the chord and harmonize with the whole. A resonant low bass (Beatbox skills are valuable, but not essential) – This person needs to have at least a strong low D or lower. Blend is important, but also the ability to adapt to a wide variety of styles. A strong solo voice is also needed. A solid baritone. The range isn’t as important as the ability to blend with the whole as well as rock out solos like a boss! While not essential, arranging ability, basic music theory and previous a cappella experience are definite pluses. Most important is attitude. We’re looking for members who have a strong work ethic and are passionate about their craft, but who enjoy singing on street corners or in restaurants for no other reason than it’s fun. Blindside rehearses twice a week for two hours each, or once a week for three hours. Additional or alternate rehearsals can arise before performances based on availability. Must be flexible for gigging since that is a focus of the group. Pay will only come from paid performances. Audio or video sample of you singing. Auditions will be held in 15 minute slots over two days in early to mid August. We will contact you to schedule a time once we receive your initial response. Additional days may come up so please inquire. Looking For Groups For “Give A Helping Paw” Benefit Concert On Sept 9th! I’m reaching out because I’m working to put together an all a cappella concert to raise $17,000 for a little boy to get a service dog that could save his life. Being blind myself, I know what it means to need a helping hand now and then, so I try to do my part and help others. Here’s the history. Last July, I learned about a seven-year-old boy named Tyler. He is low-functioning autistic, completely non-verbal, and to top it off, has diabetes. Due to his inability to speak, he can’t let anybody know when his blood sugar is low or he’s feeling sick. Even with constant vigilance, he’s nearly died several times in the past year alone. His parents have lost jobs, and even a home trying to keep him safe, and at last report, they are living in a hotel. That story alone would be enough to make this worthwhile. But as I mentioned, I heard about Tyler a year ago and got involved with an organization that was trying to help him. He and his family have been given promise after promise and it seems there is no headway in Tyler receiving a service dog that could sense when he is at risk of seizures and get him the help he needs. I think it’s high time to pull out all the stops and finally get Tyler his dog, and his family on the road to stability. I’m hoping to have a few different groups share the stage and I’d very much like for your group to be a part of it! I’ve reserved the Hermosa Beach Community Theatre, where the L.A. Regional Harmony Sweepstakes takes place every year, for Saturday, September 9. The show is being called the ”Give A Helping Paw” Benefit Concert. I hope you’ll join me in doing not a random, but an intentional act of kindness for a little boy whose life could be saved with a four-legged miracle.